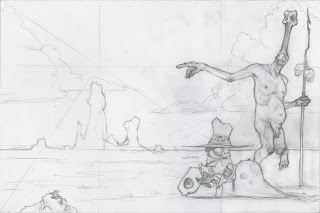 This is the sketch for the next big painting I am working on. It's gonna be pretty sweet. I'm am using a classical compositional layout, which is kind of silly, but it does make for a pleasing composition. Those old masters, and doin' things that work really well, what jokers. The actual drawing is 12"x8", the painting will be 36"x24"
Looks awesome! Looking forward to seeing the final piece!